The natural white light is made up of all the VIBGYOR colours of the visible light spectrum, which is a broad wide band of many different frequencies. 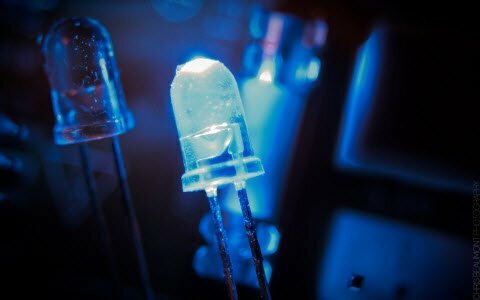 The ordinary LEDs give a light output often consisting of one colour, but even that light contains electromagnetic waves, which cover a quite wide band of frequencies. The lens system focussing the light has a fixed focal length, but the focal length required to focus various wavelengths (colours) of light is different. Therefore, each colour will focus at different points, causing ‘chromatic aberration’. The laser diode light contains only a single frequency. Therefore, it can be focused by even a simple lens system to an extremely small point. 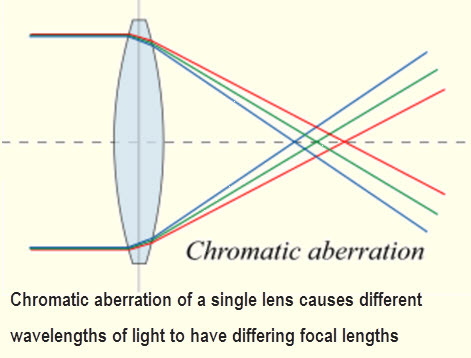 There is no chromatic aberration since only one wavelength exists, also all of the energy from the light source is concentrated into a very small spot of light. LASER is an acronym for Light Amplification by the Stimulated Emission of Radiation. 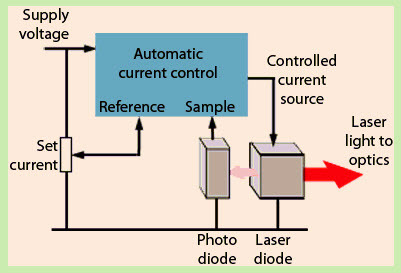 The above figure shows a simplified construction of a laser diode, which is similar to a light emitting diode (LED). 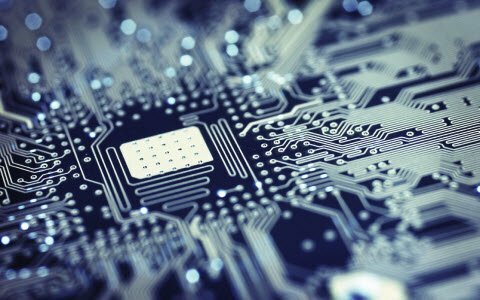 It uses gallium arsenide doped with elements such as selenium, aluminium, or silicon to produce P type and N type semiconductor materials. While a laser diode has an additional active layer of undoped (intrinsic) gallium arsenide have the thickness only a few nanometers, sandwiched between the P and N layers, effectively creating a PIN diode (P type-Intrinsic-N type). It is in this layer that the laser light is produced. Every atom according to the quantum theory, can energies only within a certain discrete energy level. Normally, the atoms are in the lowest energy state or ground state. When an energy source given to the atoms in the ground state can be excited to go to one of the higher levels. This process is called absorption. 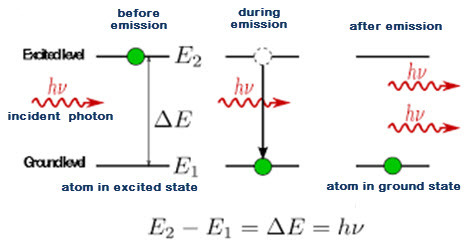 After staying at that level for a very short duration, the atom returns to its initial ground state, emitting a photon in the process, This process is called spontaneous emission. These two processes, absorption and spontaneous emission, take place in a conventional light source. In case the atom, still in an excited state, is struck by an outside photon having precisely the energy necessary for spontaneous emission, the outside photon is increased by the one given up by the excited atom, Moreover, both the photons are released from the same excited state in the same phase, This process, called stimulated emission, is fundamental for laser action (shown in above figure). In this process, the key is the photon having exactly the same wavelength as that of the light to be emitted. When favourable conditions are created for the stimulated emission, more and more atoms are forced to emit photons thereby initiating a chain reaction and releasing an enormous amount of energy. This results in a rapid build up of energy of emitting one particular wavelength (monochromatic light), travelling coherently in a particular, fixed direction. This process is called amplification by stimulated emission. The number of atoms in any level at a given time is called the population of that level. Normally, when the material is not excited externally, the population of the lower level or ground state is greater than that of the upper level. When the population of the upper level exceeds that of the lower level, which is a reversal of the normal occupancy, the process is called population inversion. This situation is essential for a laser action. For any stimulated emission. It is necessary that the upper energy level or met stable state should have a long lifetime, i.e., the atoms should pause at the met stable state for more time than at the lower level. Thus, for laser action, pumping mechanism (exciting with external source) should be from a such, as to maintain a higher population of atoms in the upper energy level relative to that in the lower level. 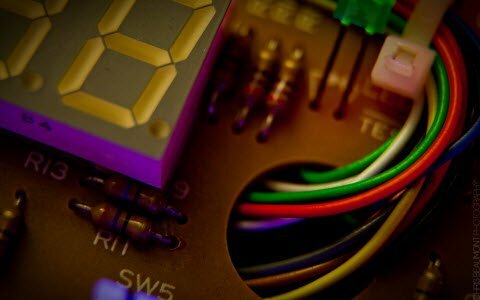 The laser diode is operated at a much higher current, typically about 10 times greater than a normal LED. 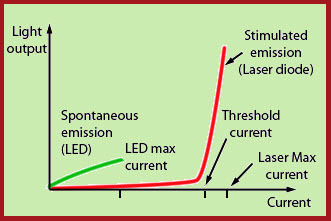 The below figure compares a graph of the light output of a normal LED and that of a laser diode. In a LED the light output increases steadily as the diode current is increased. 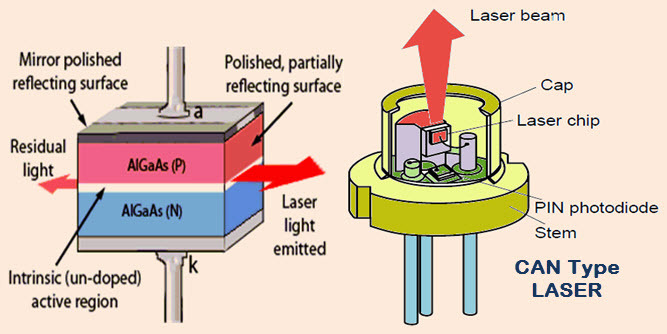 In a laser diode, however laser light is not produced until the current level reaches the threshold level when stimulated emission starts to occur. 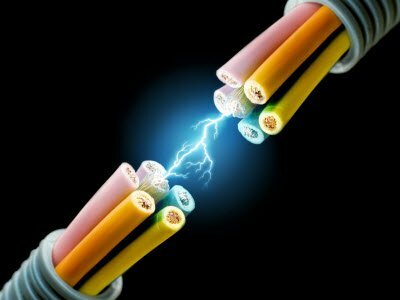 The threshold current is normally more than 80% of the maximum current the device will pass before being destroyed! For this reason, the current through the laser diode must be carefully regulated. Another problem is that the emission of photons is very dependent on temperature, the diode is already being operated close to its limit and so gets hot, therefore changing the amount of light emitted (photons) and the diode current. By the time the laser diode is working efficiently it is operating on the brink of disaster! If the current reduces and falls below the threshold current, stimulated emission ceases; just a little too much current and the diode is destroyed. As the active layer is filled with oscillating photons, some (typically about 60%) of the light escapes in a narrow, flat beam from the edge of the diode chip. As shown below figure, some residual light also escapes at the opposite edge and is used to activate a photodiode, which converts the light back into the electric current. This current is used as a feedback to the automatic diode driver circuit, to measure the activity in the laser diode and so make sure by controlling the current through the laser diode, that the current and light output remain at a constant and safe level. Laser Diode Modules are ideal for applications such as life science, industrial, or scientific instrumentation. Laser Diode Modules are available in a wide variety of wavelengths, output powers, or beam shapes. Industrial applications: Engraving, cutting, scribing, drilling, welding, etc. Medical applications remove unwanted tissues, diagnostics of cancer cells using fluorescence, dental medication. In general, the results using lasers are better than the results using a surgical knife. Laser Diodes used for Telecom: In the telecom field 1.3 μm and 1.55 μm band laser diodes used as the main light source for silica fibre lasers have a less transmission loss in the band. The laser diode with the different band is used for pumping source for optical amplification or for the short-distance optical link. 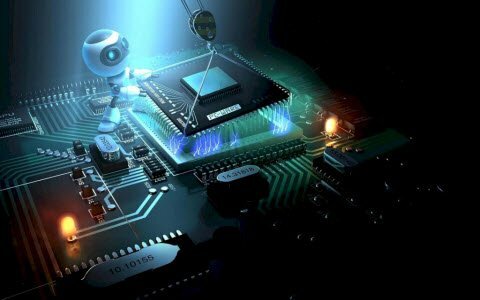 Thus, this is all about Laser Diode construction and its uses. 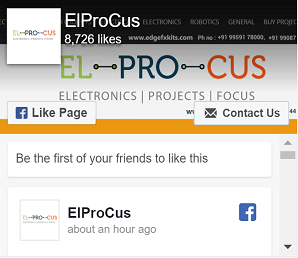 If you are interested in building LED based projects on your own, then you can approach us by posting your queries or innovative thoughts in the comments section below.Here is a question for you, What is the function of a Laser Diode? Sure, we will definitely try. Thank you!